Taylor began his career at The Locker Room as a sales associate at the Outdoors store from August of 2005 to July of 2006. After a few years of playing basketball at Faulkner State Community College, Taylor returned to work at The Locker Room Outdoors and head up the shipping and receiving department at The Locker Room of Montgomery. In March of 2009, he came on full time at the Outdoors store while continuing to handle shipping and receiving. 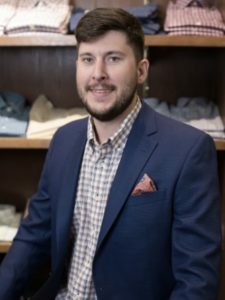 When The Locker Room Outdoors and The Locker Room of Montgomery combined into one store on February 1st, 2012, Taylor moved to Auburn to be the first full-time sales associate at The Locker Room of Auburn. He’s been in Auburn ever since, diving into a job and town he previously had no real affiliation with. Taylor has lived in Auburn since 2012. In his spare time, Taylor spends as much time outside is he can. He’s an avid fisherman, mountain biker, and camper. Taylor is the youngest of two children. He acts as a father figure to his nephew, Beckett. “That little guy has my heart. He’s a big reason why I’ve always stuck so close to home.” said Taylor.